A blue and white transfer printed soup plate. This is marked with the pattern name ‘BRITISH SCENERY’ on a scroll. This mark can be seen in the image of the reverse. It dates from c.1820 but the British Scenery series of transfers is by an unknown maker. The designs represent actual scenes from around the British Isles but the scenes have not all been identified. 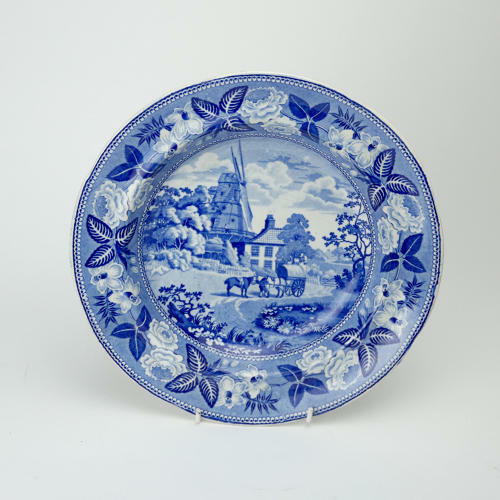 The design on this plate shows a windmill in the background with a horse and waggon to the fore. It has a floral border. The transfer, which is in varying shades of blue, is very good quality. The soup plate is in excellent condition except for some staining which only shows on the reverse.